Lung diseases often affect more than just your lungs, it can also affect your energy and strength. With COPD (or like lung diseases), shortness of breath is a common symptom which reduces the amount of oxygen the individual is able to breathe it. This lack of oxygen can result in dizziness and lightheadedness and can even lead to fainting if the low oxygen levels are not fixed. For those with COPD (or similar lung diseases), the risk of losing balance, falling or fainting is higher than those without a lung disease. This can be serious, as many with COPD are diagnosed at an older age, so losing balance, falling or fainting can be extremely dangerous. According a study published by Respiratory Medicine (a medical journal), it was discovered that those with COPD are at a much higher risk of falling than those without COPD. For those with lung diseases it is important to prepare for falls and learn methods to help prevent falls. 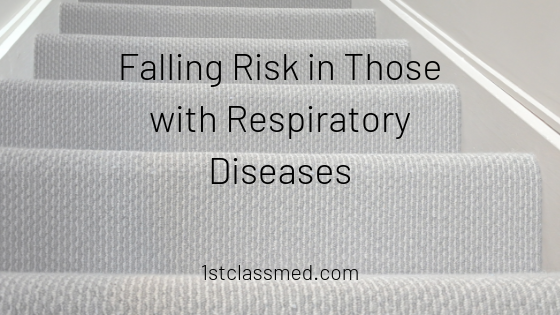 For those with COPD (and like respiratory diseases), fall risk is increased compared to most other conditions. There are multiple ways that COPD can increase your loss of balance, fall risk and fainting risk. The main way that COPD can increase your risk of falling is due to the low oxygen levels in the blood. COPD limits how much oxygen is in the body, which leads to less oxygen for your organs and your brain. These low levels of oxygen in the brain can lead to dizziness and even blackouts, which can also lead to falling. COPD can also cause weakness in the muscles in the body, including the legs, which can also result in a fall. With a lack of oxygen in the brain, you can also have impaired balance, leading to a possible fall as well. There are a handful of other symptoms that can occur in those with lung diseases that can increase fall risks as well. These symptoms such as depression, nutritional deficits and cognitive impairments can all cause falling and fainting. While it is ideal to say you will never fall, it happens to everyone in their lives and it is important to have a system in place in case you do fall. Investing in a medical alert system or have a system with family can help you if you were to fall and become unable to get back up. 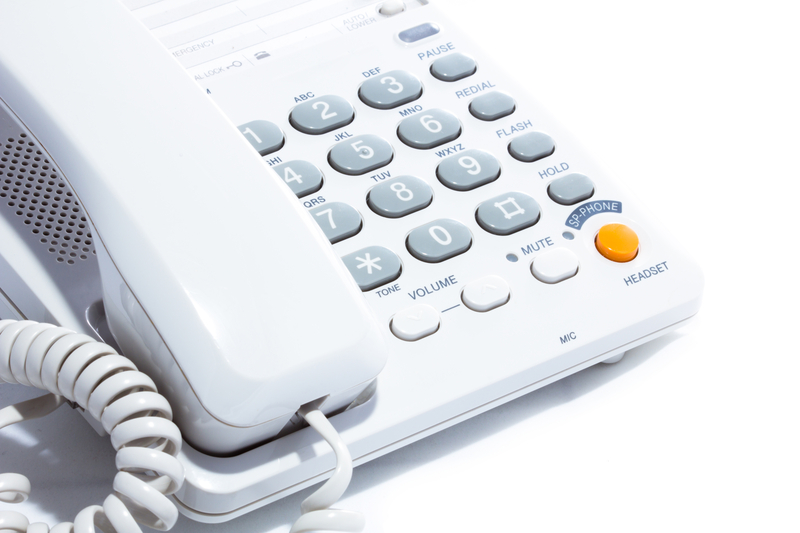 If you choose a medical alert system, it is commonly a necklace with a button that will alert a local call center who will then call medical assistance or your family. An alert system that has a built-in fall detector may be beneficial in order to get you help if you fell from blacking out and remain unconscious. An alert system or a system with your family is a great way to help you stay independent for a longer period of time without having to pay for an alert system. If you want to save money, creating a system with your family can make it easier on your wallet. Your family can set up a system where they (or you) check in once or twice a day, to make sure you are doing okay. This can be as simple as shooting them a text, email or a quick phone call, but can bring ease of mind to them and you. Beyond preparing for a fall, there are things you can do to prevent a fall as well. Make an appointment with your doctor to discuss your health to determine if your health can play a role in your fall risk. They should be able to determine if any medication or conditions can increase your risk of falling. A good way to help prevent falls is to remain physically active if it is possible for you. Speaking with your doctor about your health and your ability to be active can be beneficial, this way you and your doctor can find exercises that you can do. Any form of exercise can help keep your body strong and flexible which can help prevent falls. The right shoes can also help prevent any falls, as shoes that are not sturdy can result in a fall. High heels, flip flops, slippers and shoes that are slippery can all lead to a fall if you are not careful. Even walking in plain socks can lead to a slip and fall if you are not careful, so finding socks with grips may be safer for you. Also keep your home safe by removing all hazardous items that are on the floors and stairways in order to prevent tripping. Removing boxes, cords and trash off the ground can help prevent your feet from getting caught up in any of it. It can also be beneficial to make sure all flooring is safe, such as securing a rug so it does not slip, and making sure the floor (i.e. tiles, hardwood) is flat and nothing is lose. 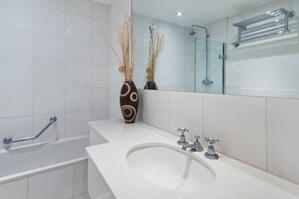 In your bathroom make sure you have non-slip mats in the bathtub and all rugs have non-slip mats underneath them. Keep your home well lit, have a lamp near your bed and make sure all light switches are near the entrance of every room in your home, this allows you to turn on the light before you fully walk into the room. Keep flashlights throughout your home in case there is ever a power outage, but keep the batteries in a zip lock bag near the flashlight. Keeping the batteries out of the flashlight when not in use will prevent any corrosion from occurring. You can also install hand rails, non-slip mats on wood steps, and bars in the bathrooms to prevent yourself from falling throughout the home. For many with COPD and like respiratory diseases, falling, fainting and losing balance is not uncommon. With a lack of oxygen in the brain, fainting, falling and losing balance is a common occurrence, but there are ways to prevent it. Speaking with your doctor about what can be done in order to prepare and prevent falling, fainting or losing balance is an important step to better your health. It is also beneficial to prepare your home to minimize all risks of falling, by removing things on the floor and adding in handrails.